No, you're not. I'm a big fan of freezes as much as you are(I seen your posts), I'm just more of a lurker. Another thing, with the larger focus on petrification fetish-wise and how fetishes tend to work, petrification will also grow on you. My point being, don't feel left out. You and I aren't the only ones who are into ice freezes and we're all grateful for the material you share with us. According to a big survey I did on all things ASFR a while ago, ice freezing is actually one of the more popular forms of ASFR. When asked to rate it on a scale of 1 (strongly dislike) to 5 (strongly like), here's how ice freezing stood up. 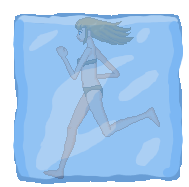 When it comes to ice encasement (victim is frozen inside a block or giant ice crystal), it was rated as follows which is ok, but not great. However, what I dubbed frost freezing (the victim is frozen in a thinner, more formfitting layer of ice possibly with icicles dripping off of them) was far more popular. In other words, people like freezing, although they prefer the subject to be frozen looking more the way (s)he is than being trapped in big ice cube. Those are some interesting numbers. (Guess I am still sorta in the minority because I prefer block freezes) I guess stone was number one and time stop was last? Petrification was definitely number 1. Of the people who ranked it on the 1-5 scale, 72.8% of people said they strongly liked it. It also got selected as the favorite type of ASFR by 48.1% of people, by far the most out of any category (although I stupidly forgot to include ice freezing at all on that question. There was an other category which got 6.7% of the vote and a "I have no favorite" which got 8.7%). Timestop was actually not the lowest rated on average: it was actually very evenly distributed between strongly dislike, dislike, neither, like, and strongly like. The worst rated on that scale was probably 2D Transformation. I'm too lazy to do the full on averages, but it's the only one where the two dislike categories had the highest number of votes. I like actual transformation into ice, as opposed to any form of encasement, but that's something I hardly ever see.